Today was devoted to stuffing my face. 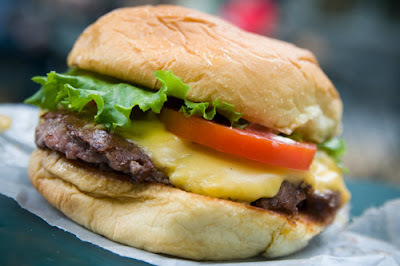 I've been hankering for a burger at Shake Shack for a while now. And devouring burgers in the park at 8:30 a.m. California time seemed like an excellent way to kickstart a drizzly New York morning. 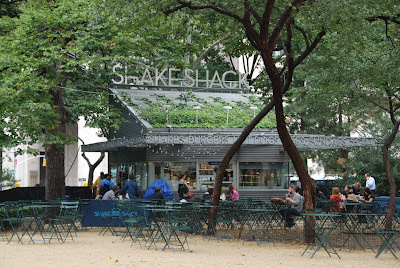 By the way: Intermittent rain + 11:30 a.m. burgers = No lunchtime line at Shake Shack -- a true rarity. In an attempt to stay Paleo (well, Paleo + Dairy), we got our Double ShackBurgers sans buns. (It's listed on the Shake Shack website, but the server nonetheless blinked in surprise when we placed our order.) Unlike In-N-Out's Protein Style Double-Doubles, the low-carb equivalent at Shake Shack doesn't come sheathed in lettuce; rather, a small 2-inch square of greens and sliced tomato sits atop the cheese and meat. 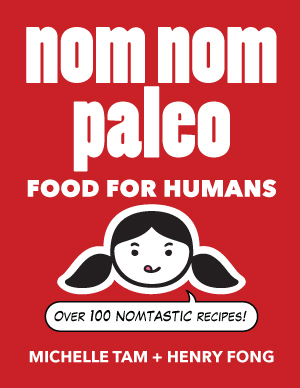 Not a problem: We tore into 'em with plastic forks and knives. I'm a devout fan of In-N-Out, but ShackBurger patties are definitely thicker, juicier and more tender. Our Doubles were perfectly seasoned and a little pink inside. 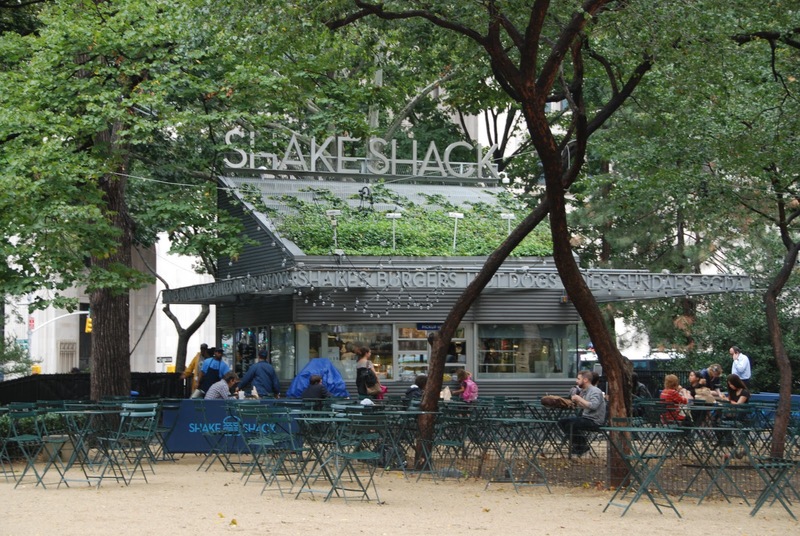 I know there've been complaints of inconsistencies between Shake Shack locations, but we had zero complaints about the meat and cheese at the Shack in Madison Square Park. Believe the hype. On another important measure, though, the ShackBurger loses out to In-N-Out: PRICE. A Double-Double at In-N-Out costs less than 3 bucks. At Shake Shack? $7.25. Plus a plane ticket from San Francisco to New York. Our burgers constituted just half of our meal. We felt the need for vegetables, so we headed a block over to Eataly -- the ginormous new Mario Batali /Lidia & Joe Bastianich Italian food emporium. Eataly reminds me of the vast food emporiums found in high-end department stores in Japan, only with nothin' but Italian food. The enormity of the place is a little staggering, and there's lots to be found in the nooks and crannies, like a fresh mozzarella bar, a Nancy Silverton-run bakery, a salumi counter (with salumi from Seattle's Salumi -- natch), and rows and rows of everything from dried pasta and canned sauce to fresh produce and grassfed dairy. 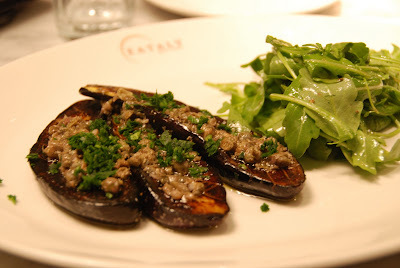 And the dishes we ordered were nothing short of amazing: Grilled Japanese eggplant with arugula and caper vinaigrette, and roasted porcini mushrooms with shaved, raw butternut squash, frisee, carmelized onions and aged balsamic. In particular, I could have eaten plate after plate of the raw butternut squash and porcinis. 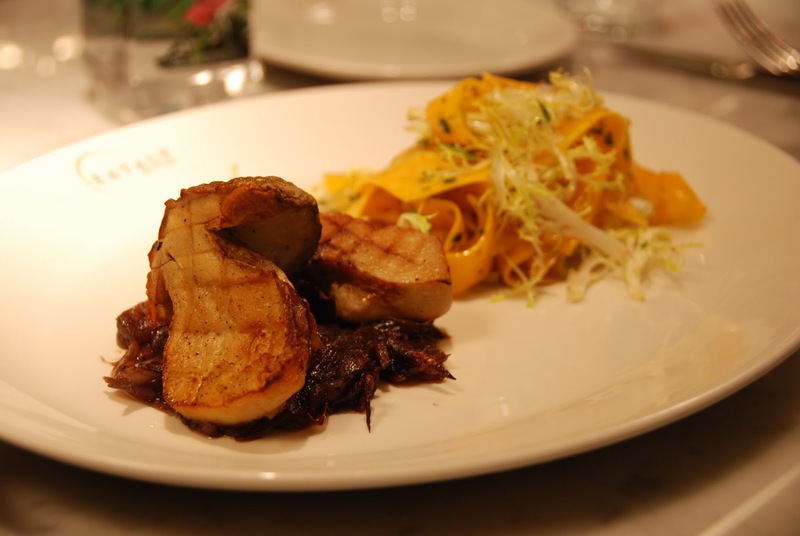 And then, for dinner, we went to Per Se. Which was ridiculous. That meal deserves it own post, which I'll try to put up tomorrow.